Need to give a technical presentation? Take your ideas and turn them into something that your boss, product manager, or even that executive in the corner office will support. What happens when you have a great idea for a new product or a redesign of an existing one? Perhaps you’re trying to improve performance, save money, or build a more sustainable product. From experience, you’ve learned with your engineering insight you can make it work. This is exactly what your company needs and has been looking for to gain that edge. How do you take your ideas and turn them into something that your boss, product manager, or even that executive in the corner office will fund and support? How do you give a strong technical presentation and pitch ideas? 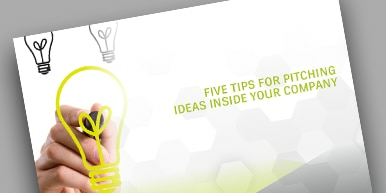 This eBook outlines five tips that can help you sell your ideas and get that next great product off the drawing board and into reality.